The design of St. Basil’s Cathedral provides strong religious symbolism and is based on architectural designs found in Jerusalem. Eight of the domes make a circular formation around the ninth dome, which looks like a star when viewed from the top. 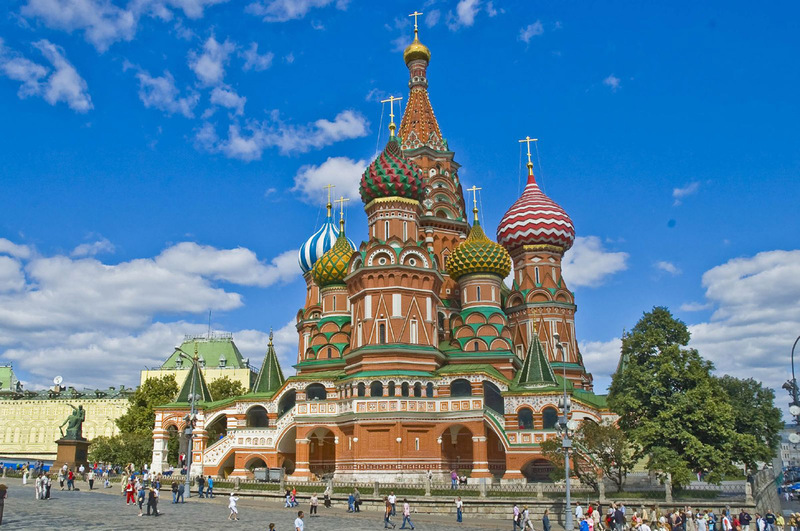 There is a deep contrast between the interior and the exterior of the St. Basil’s Cathedral. The interior contains modest decorations and the corridors are narrow, leaving little space for seating worshippers. Several times throughout its history, this cathedral has suffered damage due to fires, looting, and other incidents. In one legend, the French ruler Napoleon even wanted to take St. Basil’s Cathedral back to France with him, but due to the lack of such technology, he ordered his army to destroy it so that no one else could occupy it. His army had prepared to attack the church and had also lit up the gunpowder, but a mysterious rain shower prevented any explosions from occurring. Ummm Can you answer why it is so colourful ? This Cathedral looks really cool!!!!!!!!!!!!!! I am doing a report on Famous Landmarks in Russia and this has perfect information. St Basil was very influential in the formation of the Russian Orthodox Church and his rel;ics are buried in the church. There are nine domes which correspond to nine separate altars , each of which commemorates victories Ivan the Terrible won. BTW, “New Jerusalem” is a name for the Kingdom of God, Heaven. Does anyone know what century the “holy fool” St. Basil predicted the fire in Moscow. What would the price be to visit it. I have been to the cathedral a few times but inside only once. It is as amazing as it looks and if you have a chance to see it, do. 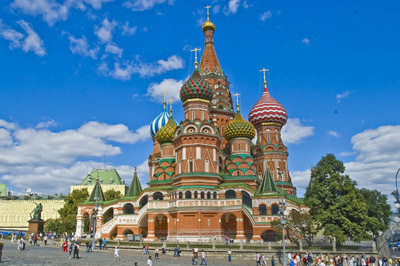 The kremlin is within walking distance and there are museums and other places of interest. None as spectacular as the cathedral but all as unique in style and history. In terms of cost, moscow is the most expensive city in the world. But you can rent apartments from private people who are traveling and it is much cheaper. What a wonderful church.it is very inspiring. From my early childhood i am very eager to visit this world wonder (i think so)it looks like a palace in ancient stories. I like it so much along with kremlin. i wanna have this one day..will help mmh!! i wanna have this one day..wil you help mmmh!! That great ancient temple! This is the one of famous temples in the world that it is unbelievable that blind person can build this temple. It’s strong and mysterious. i am doing an essay on some of the most popular tourist sites in russia and this will be in my essay! this so beautiful,just like beautiful balls placed on one another. can i get married here? we are British? DOES ANYONE KNOW IF ST BASIL THE GREAT HAD ANYTHING TO DO WITH THIS?? Did he nspire it or was he buried here or somethng??? Plz help!! 🙂 thanks! I’m doing a project on this cathedral and it is so easy because there is so much info on the web about it ! and actually the official name of th cathedral is “The Cathedral of the Intercession of the Virgin by the Moat” . I would know . I am part russian . Visited the place last month. Best time of the day to tour for photography is in the late afternoon.